A state of anarchy occurs when there is no organization or order, especially when no effective government exists. If you deal with a difficult situation with aplomb, you deal with it in a confident and skillful way. Bedlam is a situation with a great deal of noise and confusion. Someone who is boisterous is noisy, excitable, and full of boundless energy, and thus shows a lack of disciplined restraint at times. A cacophony is a loud, unpleasant mixture of sounds. A cataclysm is a violent, sudden event that causes great change and/or harm. A chaotic state of affairs is in a state of confusion and complete disorder. Two people concordant with each other are in agreement or harmony. Consternation is the feeling of anxiety or fear, sometimes paralyzing in its effect, and often caused by something unexpected that has happened. When you are given a directive, you are given an instruction or order that directs you to do something. When you are in a state of disarray you are disorganized, disordered, and in a state of confusion. If something discomfits you it makes you feel embarrassed, confused, uncomfortable, or frustrated. If something disconcerts you it makes you feel anxious, worried, or confused. A situation that is discordant does not fit with other things and is therefore disagreeable, strange, or unpleasant. When one feels disquiet about a situation, one feels very worried or nervous. Entropy is the lack of organization or measure of disorder currently in a system. If you show equanimity you demonstrate a calm mental state, without getting upset or annoyed, when you deal with a difficult situation. Euphony is a pleasing sound in speech or music. To foment is to encourage people to protest, fight, or cause trouble and violent opposition. A fracas is a rough and noisy fight or loud argument that can involve multiple people. When two people are in a harmonious state they are in agreement with each other; when a sound is harmonious it is pleasant or agreeable to the ear. When there is havoc there is great disorder, widespread destruction, and much confusion. If someone is imperturbable she is always calm and not easily upset or disturbed by any situation, even dangerous ones. A maelstrom is either a large whirlpool in the sea, or a violent or agitated state of affairs. A melee is a noisy, confusing, hand-to-hand fight involving a good number of people. If you refer to an organization or system as a monolith, you mean it is very large and unwilling or very slow to change and adopt something new. A muted sound is quiet or purposely softened in some way. A paroxysm is a sudden uncontrolled expression of emotion, or a short attack of pain, coughing, or shaking. A placid scene or person is calm, quiet, and undisturbed, and generally tends to remain so. A raucous sound is unpleasantly loud, harsh, and noisy. If you are in a state of repose your mind is at peace or your body is at rest. A serene place or situation is peaceful and calm. A sonorous sound is pleasantly full, strong, and rich. Stasis is a state of little change over a long period of time. If you are steadfast you have a firm belief in your actions or opinions and refuse to give up or change them because you are certain that you are doing the right thing. If you say someone is stoic you mean that he does not show his emotions and does not complain when bad things happen to him. A tempestuous storm, temper, or crowd is violent, wild, and in an uproar. If something is tranquil it is peaceful, calm, and quiet. A tumultuous event or period of time is filled with great excitement, confusion, or violence; a tumultuous reaction to something is likewise very loud and noisy because people are happy and excited. Turbulence describes a state of extreme disorder or confusion, and can also refer to unpredictable wind currents. When you experience turmoil there is great confusion, disturbance, instability, and disorder in your life. To be unfazed is to not be affected by something that happens to you, even if it is quite embarrassing or bothersome. A utopia is an idealized perfect place, where everyone is in agreement. A welter of something is a large and confusing amount of it. Sheer pandemonium and chaos broke out when the third graders noticed that the class boa constrictor was not in its cage. The teacher could not control or lessen the screaming that followed in such disorderly pandemonium. Finally, when the pandemonium and unruly uproar died down, the teacher could finally explain that the boa constrictor was at the vet, not lost in the classroom, and would be back on Tuesday. Quiz: Try again! What is pandemonium? A chaotic state of pure disorder and utter confusion. A situation caused by something beyond anyone’s control. Not knowing what to do in a difficult situation. Pandemonium is a very noisy and uncontrolled situation, especially one that is caused by a lot of angry or excited people. Demon Panic When the three-horned, red-skinned, and horribly grinning demon walked into the crowded room, all the people were thrown into an immediate panic, which increased into complete pandemonium when another demon appeared through the other door to the room ... and made sure both doors were locked. Pandemonium originally referred to the home or capital of all the demons or evil spirits that inhabited hell, who were not particularly interested in being calm or law-abiding. 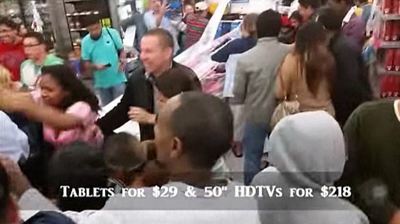 YouTube: Celebrity TV Shopping pandemonium!